Bangkok is full of amazing hotels. If you are looking for a luxury international brand or a boutique hotel offering only a few unique rooms. Choosing the perfect hotel can really help jump start your medical vacation to Thailand. Business and Medical Tourists will feel at home at any of the over 100 high-end hotels in the Sukhumvit or Siam-Ploenchit and areas, while shoppers might want to stay in or nearby Chidlom or Siam, areas where glittering new mega-malls are just a few steps away from your hotel’s doorstep. For Treatment purposes, we recommend looking for hotel rooms in the Sukhumvit, Silom or Sathorn Areas of Bangkok Only. Silom and Khao San are known as the center of Bangkok’s exciting nightlife scene and both areas offer a very extensive lineup of rooms and hotels that cater to a wide range of budgets from Backpacker to newly weds. If culture and history are going to be a major part of your trip, then we recommend you stay close to the chao praya riverside for easy access to Old City Bangkok’s attractions, that include Wat Arun,Wat Phra Kaew, Grand Palace and Wat Po. 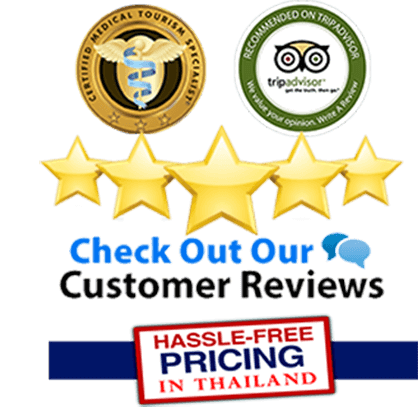 Thai Medical offers pre-negotiated “Medical Tourism” rates allow for a wide range of hotels in Bangkok in every price category,style and in all popular locations. Over the years, TMV has built direct relationships with most of Bangkok’s top hotels allowing us to negotiate great rates for you for both the medical treatments and hotels for your medical tour to Thailand. For any other questions please contact us.